Of the many things I appreciate about the Catholic education my children have received here in Ohio, one that is pretty high on the list is the schools’ endeavors to educate parents who may have been poorly catechized or who may not even be Catholic themselves. Starting when our kids are in Kindergarten, we parents are assigned pages in the kids’ religion workbooks to read and sign. In the upper grades, a two-sided ditto comes home explaining the meaning and significance of different parts of The Mass and of other aspects of Catholicism. This past week’s from my daughter’s teacher was an explication of The Eucharist. I don’t know how these items are received by other parents, but I am greatly encouraged by them. The gesture shows me that the school’s administration is cognizant that some parents who sincerely want a solid Catholic education for their children may not necessarily have gotten one themselves. They are also offering reminders for those who may be taking the miracles and wonders of our unique and beautiful faith for granted. 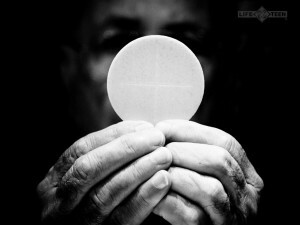 As I read the material on The Eucharist, I thought about my daughter’s First Holy Communion, the realizations she had — that she was actually going to have Jesus inside of her body, that she was responsible for making sure that her soul was in a state worthy to receive before she did so, and that this, the Eucharist, was not only the high point of The Mass, but truly the foundation for our faith, as it is Jesus Himself. As a convert, I shared her enthusiasm. After all, I had only been Catholic a few years myself. It is my hope that our children never take in stride that they are privileged to be offered the life-changing gift of The Real Presence that we have in our Church. The full knowledge of what we are receiving, of whom we are receiving, comes to us at different times. Surely always at the elevation, the consecration, or in adoration, but at other times as well. Later at home, I pondered the Mass in its entirety. When I was a Protestant, it was all about the sermon. I came ready to learn, almost ready to take notes! But now as a Catholic, even as I sit dabbing my eyes after a moving homily, or rush back to my car to write something down after Mass that Father said, that is NOT the main attraction. I’m there for Jesus. My heart still pounds as I approach the altar to receive Him on my tongue! And then my prayers — they fill my head — for what will I use this medicine? How will Jesus act in me this day, this week? There is simply no substitute for Jesus Himself, hidden in that little host, but bigger and more important than anything that could ever happen to me or has happened to me ever in my life. A lot of Catholics I know, myself included, enjoy Protestant devotions and writers now and then. It occurred to me that I have a pattern, though. They never hold my attention for very long. Something is missing. I don’t speak here of theological error, for there is plenty written that is solid and in agreement with the tenets of Catholicism. What is missing is that dimension beyond — beyond the Bible, beyond the physical, beyond a “good word” given to a preacher, no matter how wonderful of a man he is. I’m always left wanting because they don’t include, nay, can’t include, any mention of the power and enormity of The Real Presence. Even as I read an article or devotional that is just smashing in its style and right on target in its theme, by an author whose writing makes mine look like a high school entrance essay, I find myself wanting to edit it to include The Eucharist somehow. I’m not so interested in asking ‘What would Jesus Do?’ I want to talk about and hear about what Jesus IS doing right now, and that is waiting. Waiting in the Tabernacle for you and for me. And offering. Offering Himself to us, to participate in his singular and world-altering sacrifice again and again. Humbling. Humbling Himself, the King of the Universe, Being Itself, That and Whom Upon Which Everything else sits and hangs and depends, and He is there waiting for you, available daily not just to sit with and pray before and talk to and cry to, but there for you to consume. He will become a part of you, body and soul, heart and voice, in your bloodstream. If you are a Catholic who has forgotten or somehow lost your sense of the absolute and mind-blowing phenomenon of The Real Presence, remember it’s never too late. Jesus is not limited by time or by your vagaries. He is there, and will continue to be there as long as there is a Catholic Church, and that, my friends, will be forever, because the gates of Hell will not prevail against our Church. Do you want to know Jesus better? Have a better relationship with Jesus? One that is more personal? Do you want to know what He would do? How He would act in your life if He could? Joining with Him, flesh to flesh, blood to blood, soul to soul, is the way He has given us to do just that. Don’t wait another day.